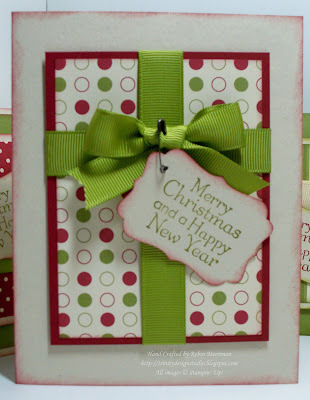 Trinity Designs: It's a Jolly Holiday! I love easy cards - don't you? I mean, I think we all want to make something beautiful, but we don't always have the time to devote to a masterpiece each time we stamp. 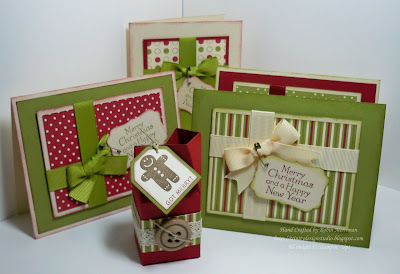 One of the reasons I love Stampin' Up! so much is all the coordinating products they offer us to work with. It really is the 'easy button' of stamping! Combine that with a basic 'formula' for a card and you truly can create some lovely cards and projects in very little time. But, serendipity is always welcomed in my studio, so I ran with it! All the Designer Paper pieces are cut at 3" x 4", allowing you 12 pieces from each sheet of Designer Paper. 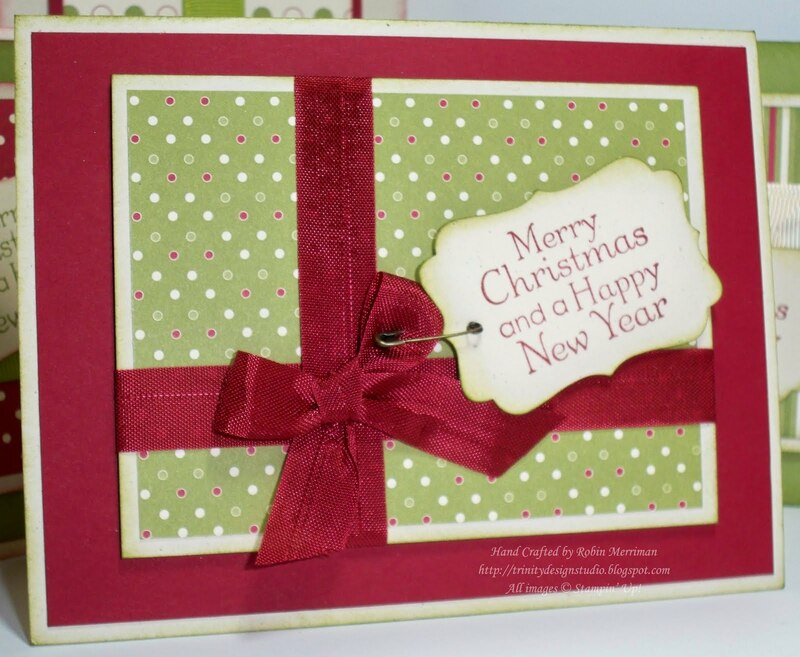 You can get 144 cards similar to these from just one package of Designer Paper! That's what I call a bang for your buck! Don't you just love how that Cherry Cobbler Seam Binding shimmers? Oh, it's so lovely and so easy to work with too! It really doesn't get much easier than this simple beauty. If you come to my classes, I know you would say that the bow is the hardest part! HA! Speaking of classes, would you like to attend a class and leave with 36 of these completed beauties?! I'm about to post my final class schedule for November and December and am considering offering this class so let me know if you are interested! Have a great day everyone and be sure to come back and visit tomorrow to see the Stamping 411 Sketch Challenge card I have for you! If you like Vintage, you might like it a little bit! Beautiful cards ... and you're right, the bow would be the hardest! TFS! Just wondering one more thing -- what stamp set is the sentiment from? I'm thinking this is something I could showcase samples for at my class next week.